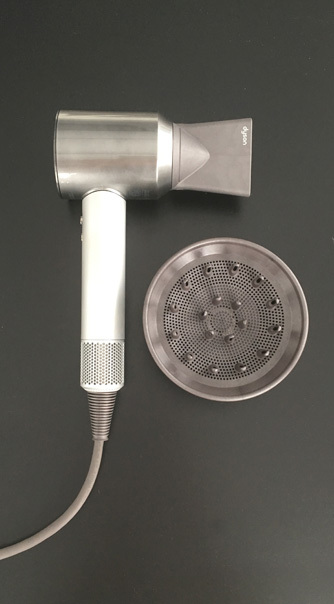 Aside from the obvious that the hair dryer isn’t available for general retail sale, the Dyson Supersonic Professional Edition comes with a professional concentrator (nozzle) that gets closer to the hair shaft than the retail version. For stylists, this means AN EVEN FASTER and SAFER way to get the hair completely dry, smooth, and frizz free. You can also recognize the Professional Edition and all it’s glory by the exclusive Nickel and Silver finish, which again you can’t buy in retail stores. The retail versions (so far) come in white/silver or iron/pink finishes, just as an FYI. Also, the pro version has a longer cable, which for a stylist is a much appreciated necessity. Good question. We all know the retail version is $399, however, the Dyson Supersonic Professional Edition pricing isn’t advertised because it really depends on the buyer. 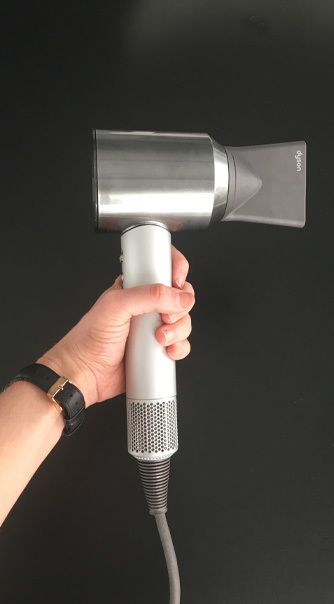 If you’re a salon looking to purchase multiple hair dryers for all of your stylists, you’re obviously going to get a bigger pricing break than if you’re just one stylist inquiring about one hair dryer (#obvi). Just submit a registration inquiry on their website in order to get qualified to purchase. IS IT JUST A BUNCH OF HOT AIR? Seriously though. As much as we wish we could be the ones to say this premium priced hair dryer is no different than the ones on the market for less, well, sorry folks, but it IS DIFFERENT. Per Dyson’s usual reputation, they have once again launched an exceptional product that surpasses industry standards. Which is likely why, even as you’re reading this review, you’ve already read several other reviews tooting Dyson’s horn about this hair dryer. And of course it won Allure’s Best of Beauty Award for 2016, as if you didn’t already see that coming. Testing the hair dryer out on a model, we wanted to see how quickly we could round brush and moderately soft set her hair. 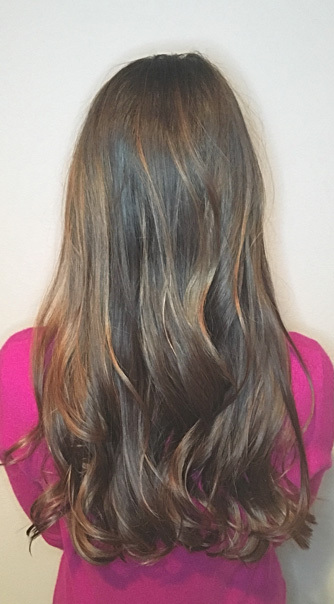 We use the term ‘moderately soft set’ because we wanted to do a quick, realistic salon blow dry and finish versus a full on blow out appointment. As a stylist, you’re definitely going to take more time to do a whole soft set, but for the majority of your appointments your blow dry time is going to be much faster, with emphasis on trying to get all of the roots and remaining hair 80%+ dry before putting on the nozzle and using a round or paddle brush for finishing. It took us just under 15 minutes total to get this finished look, going from towel dried wet hair to completely dry and styled, using an Ibiza Large EX4 boar bristle round brush. Take in to consideration the amount and length of this model’s hair and we were pleasantly surprised with the timing. As a hair stylist, you know the importance of investing in your tools, especially the ones you’re using day in, day out, regardless of the service. Aside from shears, your hair dryer is likely the top tool to invest in equipment wise and getting a Dyson hair dryer shouldn’t feel like an excessive purchase. As a brand, Dyson is sort of notorious with ‘status symbol’ recognition, but in the specific case of their hair dryer, we feel the product is definitely worth the price. Have you tried the Dyson Supersonic yet? Let us know what you think in the comments below and what questions you have! Let’s #tooltalk people!